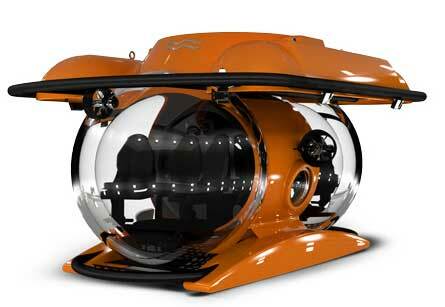 U-Boat Worx has introduced their newest model line, the Cruise Sub. These subs dive from 200 to 1,140 meters with 5 to 9 passengers plus 1 pilot. The double sphere construction allows for 3 abreast revolving chairs for comfort and great viewing. Plug in power and simple pre-launch procedures permit easy use of the Cruise Subs. Why go to exotic locations on the water and not explore under the water, too? With the Cruise Sub, you can see the best of both worlds including under the sea. Go to the U-Boat Worx page to learn more about the Cruise Sub other submersibles by U-Boat Worx.